Two narcotics detectives, "Popeye" Doyle and his partner Buddy Russo (Gene Hackman, Roy Scheider), start to close in on a vast international narcotics ring when the smugglers unexpectedly strike back. Following an attempt on his life by one of the smugglers, Doyle sets off a deadly pursuit that ultimately takes him far beyond mere New York City limits. Based on a true story, this action-filled thriller, with its renowned chase scene, won five Academy Awards® including best picture and Best Actor for Gene Hackman. Download The French Connection in Digital HD from the iTunes store. 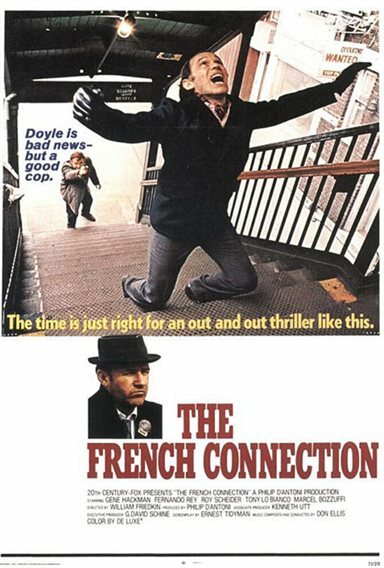 The French Connection images are © 20th Century Fox. All Rights Reserved. 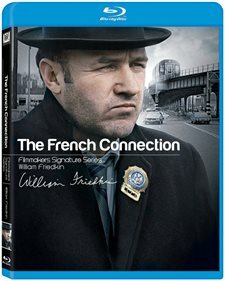 Taking a ride with Popeye Doyle in The French Connection just became easier now that it's on Blu-ray. Just released as part of a Filmmakers Signature Series the high energy classic film, a winner of an Academy Award for Best Picture, is a must have treasure for any adrenaline seeking film buff. I've seen the movie several times when it came out on video and then Blu-ray in 2009, but this 2012 version played on my HD TV is like going to a movie house. Based on true accounts, the movie centers on a drug case brought to light by detective Jimmy "Popeye" Doyle (Gene Hackman who's character is based on New York Detective Eddie Egan) and his partner "Cloudy Russo (Roy Scheider who's character is based on Egan's partner Sonny Grosso) during a routine shakedown. Taking a break the two go to a nightclub where they spot Sal Boca (Tony Lo Bianco) a local hood who looks suspicious to Doyle. Doyle and Russo follow him from the club and see him dealing narcotics. After many long stakeouts they get a lead that a French crime lord Alain Charnier (Fernando Rey) may be the connection to where Boca has been getting his drugs. When Charnier takes a trip to New York to visit Boca, Doyle and Russo are hot on his trail. The acting and direction are super good making the film an instant classic for the time period. Even without the use of many of today's special effects and computer graphics the film takes on a dark tone with realistic action that's just as enjoyable to watch. Friedkin keeps his characters ‘real' and dangerous to the criminals they seek. Pulling no punches he uses abusive language and tough tactics to show the realism of the cops who interrogate their subjects on the street. Both Hackman and Scheider are perfect for their roles as the determined detectives who stop at nothing to get the information they need to break a case. The French Connection shows the low life from the streets, a fast chase under a New York elevated subway and a non-stop story that delves into part of the life of true cops. For one of his best performances as Doyle, Gene Hackman walked away with a Best Actor Oscar at the 1971 Academy Awards. As Director, William Friedkin took home Best Director while Producer Phillip D'Antoni was honored with the Best Film trophy. Nominated for 8 awards, the production also received Oscars for Best Adapted Screenplay and Film Editing. As Sonny Russo, Roy Scheider received a nomination for Best Supporting Actor in the film losing out to Ben Johnson who won for his performance in The Last Picture Show. Hackman on Doyle- Hackman looks back at his character giving Popeye Doyle more perspective. The Video Quality of this 2012 release in Blu-ray has a brighter color and almost a complete absence of any blurring. The transfer from the original negative to this nicely remastered Blu-ray production makes for impressive viewing. The 1.85:1 Widescreen presentation fills my 16x9 HD Television with no bars top and bottom. The Audio Quality at DTS-HD Master Audio 5.1 is magnificent played on a Blu-ray player though my HD Television speaker system. The surround sound worked remarkably well especially during the altercations between the detectives and the drug lords. You can hear the guns going off throughout the room giving the film a realistic feel and the dialogue's not diminished in any way.